Comes in capital letters only. Spelling and Punctuation will appear exactly as you entered it on your order, so if you want an apostrophe "s", you must add it. Each cleaning & care kit is good for 1-5 liter size barrels. Comes with 1oz Oxy-San, 1oz Citric Acid, 1oz Barrel Wax & 4 Campden Sterilizing Tablets. Use when storing your barrel (1 tablet per gallon of water) or use with water when cleaning & sterilizing your barrel (2 tablets per gallon of water). This product is also used when making wine, beer or cider. If you are making wine or beer, please refer to your beer/wine/cider making supplier instructions. 750 ml vodka or grain alcohol for every bottle of essence. For best results, fully filling the barrel is ideal. Only choose exact flavor, if buying specific quantity per last question. If you choose flavor, but don't purchase, you will not receive essence. 750 ml vodka or grain alcohol for every bottle of essence. For best results, fully filling the barrel is ideal. Yes, the personalizations entered & options selected are correct. Use for decor or to serve or age your favorite beer or liquor. This engraved personalized Man Cave Small Oak Barrel - Lions Crest is handcrafted from premium quality American white oak, the same that most wineries and distillers use, is charred inside and comes with a series of black steel hoops around the barrel. Color of the barrel is medium toast and comes with a wood stand, bung, and wooden spigot. Perfect for aging and or serving whiskey, brandy, bourbon, rum, beer, wine, tequila, scotch, cognac other spirits, barrel aged cocktails (no citrus or dairy ingredients though), balsamic vinegar, homemade hot sauce or tabasco sauce and even barbeque sauce. 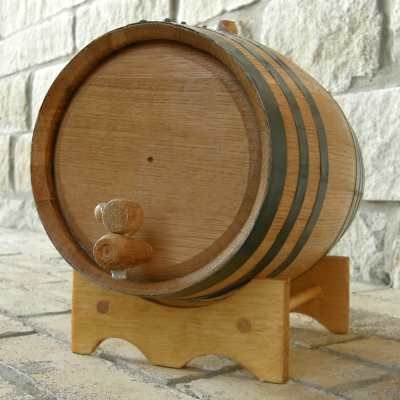 Personalize this mini oak barrel with your name. 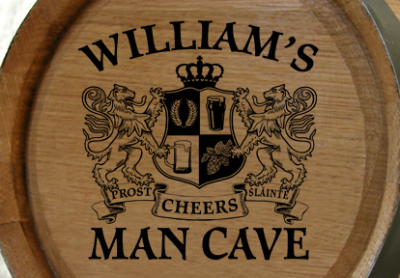 A Man Cave Gifts Exclusive! Click HERE to visit our Small Oak Barrels section to see our entire collection of personalized mini oak barrel designs. Many fantastic designs to choose from. Do you want to age spirits, beer or wine in this Small Oak Barrel? You can use this barrel to age your favorite liquor or create your own spirit such as bourbon, whiskey, rum, etc... by simply mixing vodka with your choice of liquor essence (sold separately). Barrel care and use instructions are included with every mini barrel purchase. Planning to make your own spirits? Read below for other products that you can purchase to create your own mini oak barrel kit. Remember, the smaller the barrel, the quicker the aging process and aging depends on your taste. For more information regarding Small and Mini Oak Barrels, see SMALL OAK BARREL INFORMATION. *Note: When personalizing your mini barrel, distillery names and liquor brand names are not allowed to be engraved on barrels (eg. Jack Daniels, Jim Beam, Devil's Cut, etc... ) due to licensing agreements. 3 Liter 10" x 7"
5 Liter 11.25" x 8.5"
10 Liter 13.5" x 10"
20 Liter 18" x 12"
* All small (mini) oak barrels being sold throughout the USA & world, including the ones we sell, may have variances (color, wood grain, etc... ), especially due to the fact that they are handmade. If you or your gift recipient intend to use any mini oak barrel (ours or one bought from another company) rather than using it just for decoration, we strongly recommend you cure and fill the barrel within 90 days of receiving it to prevent fully drying it out. ** The free barrel wooden stand that comes with the barrel may vary in shape/look, since they are handmade. ADD a Cleaning and Care Kit: One kit good for 1-5 liter size barrels. For larger sized barrels, such as 10 and 20 liter barrels, you may want to purchase a second kit. Cleaning kit includes: 1oz of Oxy-San, 1oz of Citric Acid, 1oz of Barrel Wax & 4 Campden Sterilizing/Storing Tablets. Instructions come with every kit. For more information about the the cleaning and care kit, see Cleaning and Care Kit Information for Small Oak Barrels *Note - All products in this kit are made by the same manufacturer. Suppliers vary due to product availability. ADD 12 Campden Sterilizing/Storing Tablets: Use when storing your barrel or when cleaning & sterilizing your barrel. For more information regarding the sterilizing and storing tablets, see Cleaning and Care Kit Information for Small Oak Barrels. ADD Liquor Essences: Use to create your own spirit. For every bottle of essence you will need 750 ml vodka or grain alcohol. For best results, fully filling the barrel is ideal. For more information on liquor essence flavors, see Liquor Essence Information. *Note - All liquor essences are made by the same manufacturer. Suppliers vary due to product availability. Therefore, art design on the label of the product may vary, but the selection and flavor choices remain the same. PERSONALIZATION: FREE. Spelling & punctuation will appear exactly as you entered it on your order. Remember, the more characters, the smaller the text. PROCESSING/SHIPPING: Approximately 1 business days for processing and 2-4 business days for shipping. NEED IMMEDIATELY? See IN A RUSH? See Holiday and Father's Day Shipping Schedule in May, June, November & December.